Last weekend was a long weekend (Martin Luther King Day on Monday), and I briefly had fantasies of getting a lot of stuff done. The trouble is I never settled on exactly what it was I would get done, so I ended up doing very little. I read science fiction, I slept a lot, I tinkered with my book a little bit, I got the live Christmas tree out of the house, and I adjusted the brakes on my bike. but that’s about it. 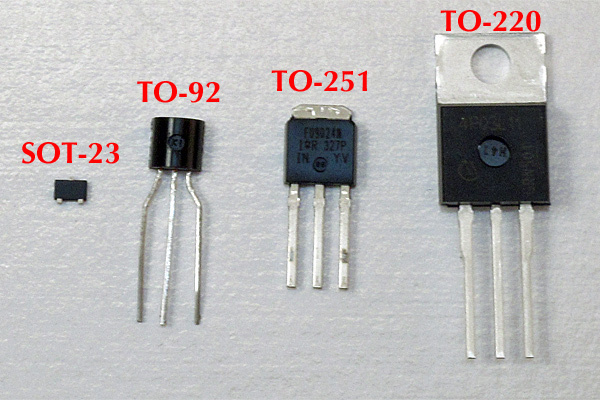 Some of the most common packages for FETs. We used to use TO-220 and TO-251 packages for the class, since that is how power FETS are most commonly packaged, but the power FETs are getting expensive (the cheapest ones keep getting discontinued—maybe they were cheap because they were end-of-life, or maybe they were discontinued because there wasn’t enough profit at the low price point). We had problems last year with TO-251 packages not staying in the breadboards—the springs seemed to pop the leads out rather than grabbing them. 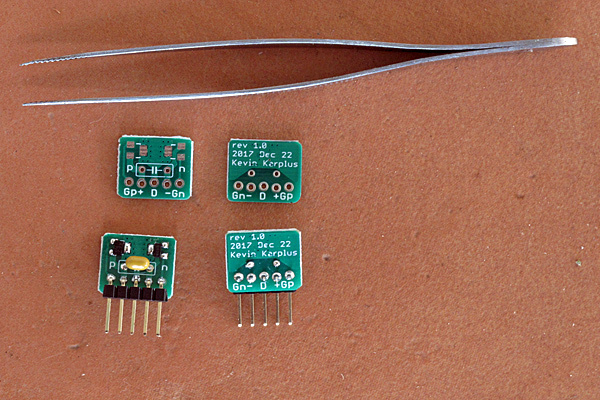 This year we’ll be using the SOT-23 transistors, which are much cheaper, and soldering them to a breakout board. I’m a little worried about how many of the students will have trouble with hand-soldering the small parts. They’ll have had a little more practice soldering by then, so I’m hopeful that it will go ok. The other changes to the book were mostly typo fixes for problems found by my students. The students have been very good this year at reporting problems to me, and there were a lot more typos than I expected (averaging about 1 every 3 pages). So far they’ve not pointed out any substantive errors, though there was one omission that I’ve fixed—it seems that some students have not heard of raster image formats, and thought I was trying to say “faster image formats”, so I’ve added a couple of paragraphs about image formats. The changes that I’m making this quarter will be in the next release, which will probably be in March, during spring break. In Breakout board for SOT-23 FETs, I gave the schematic and layout pictures for a half H-bridge breakout board using SOT-23 surface-mount FETs. The boards arrived today, 12 days after I ordered them. 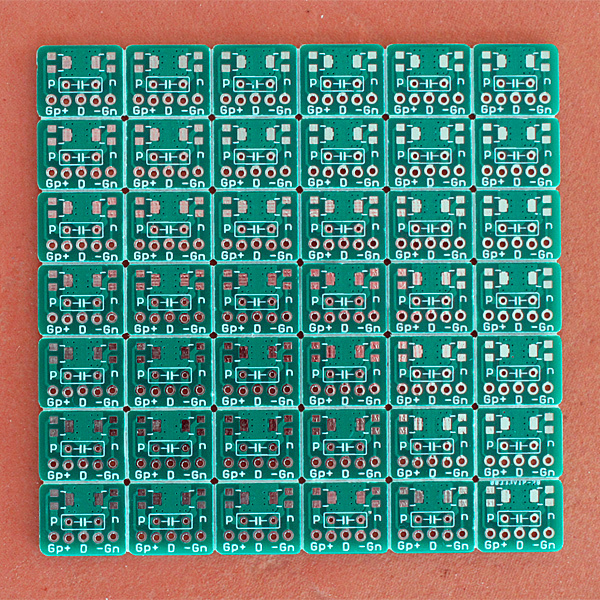 The boards cost $4.86 plus $23.79 shipping, but I had them panelize the design, and they sent me 13 copies instead of 10, so I ended up with 546 boards (instead of 420), making a cost of 5.24¢ each. One of the panelized board. The panels are just separated with V cuts, so the corner rounding is not very good, but there is some, and I did not end up with sharp corners after cutting off a row of boards with tin snips. With the transistors, capacitor, and headers, each half H-bridge will cost under 40¢ in 100s—much less than the approximately $1.37/half H-bridge that separate TO-220 FETs cost. Put the board face up on the bench. Place one FET using sharp-pointed tweezers. Tape the FET and the drain side down with a tiny piece of blue painters’ tape. Solder the source and gate. Repeat for the other FET. Put the headers through the holes (from the component side). Flip the board over and solder the header. Put the header pins into a breadboard at the edge of the board. Insert the capacitor from the component side. Prop the breadboard up so the solder side of the board is exposed. Solder the capacitor in place and trim its leads. Soldering the first board went well. The second one was a little harder (I had a bit of hand tremor), but still only took a few minutes. Having made the lands huge (big enough for wave soldering) made alignment fairly simple—I did not have to be exact. I tried one FET without the trick of taping the FET in place—that did not work at all, as the FET moved completely off the pad when I tried to solder. I had to remove solder from the board with a solder sucker and redo the FET using tape. Here are the front and back of the boards before and after populating, along with the pointed tweezers I used for placing the FETs. 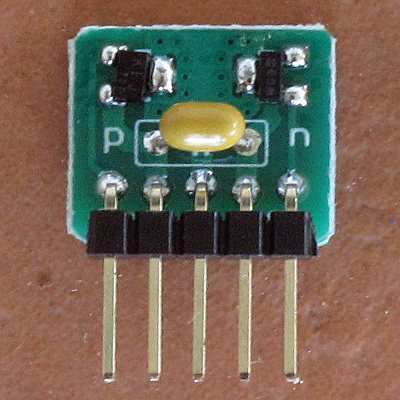 Here is a close-up of one of the two boards I soldered (the one with the worst alignment—see the pFET at the top left). 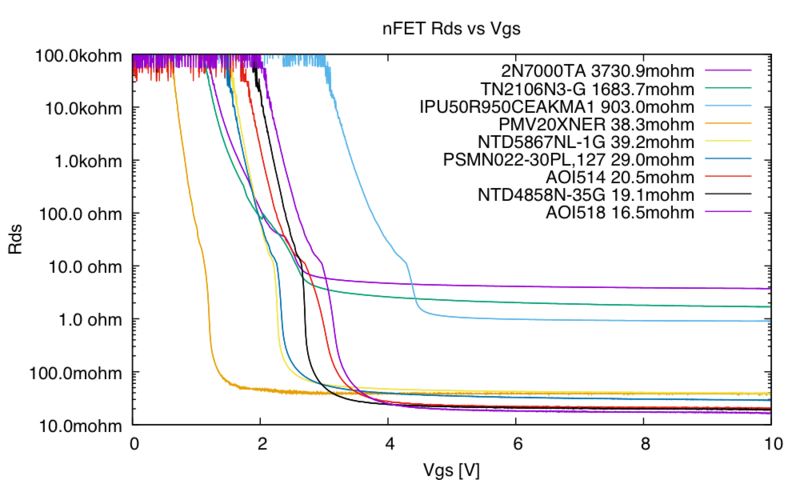 The PMV20XNER transistor has a much lower threshold than the other nFETS I’ve looked at, but a comparable Ron to the other power nFETs. 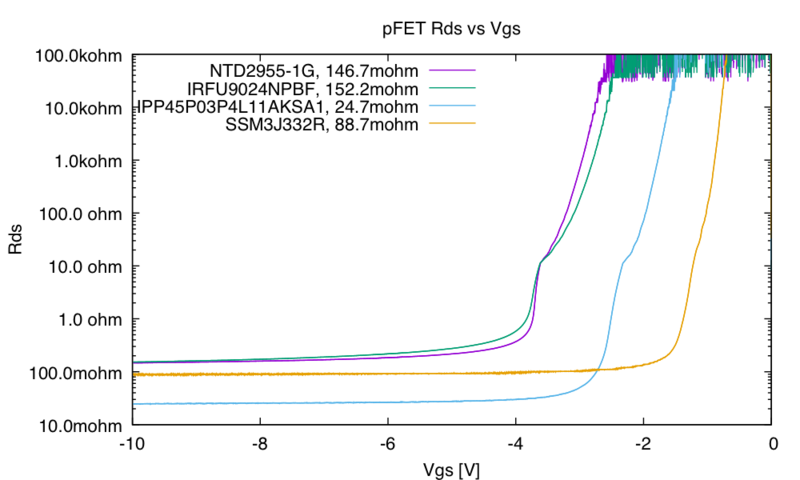 The SSM3J332R pFET also has a low threshold voltage and the on resistance is in the same range as others we have used in the past. 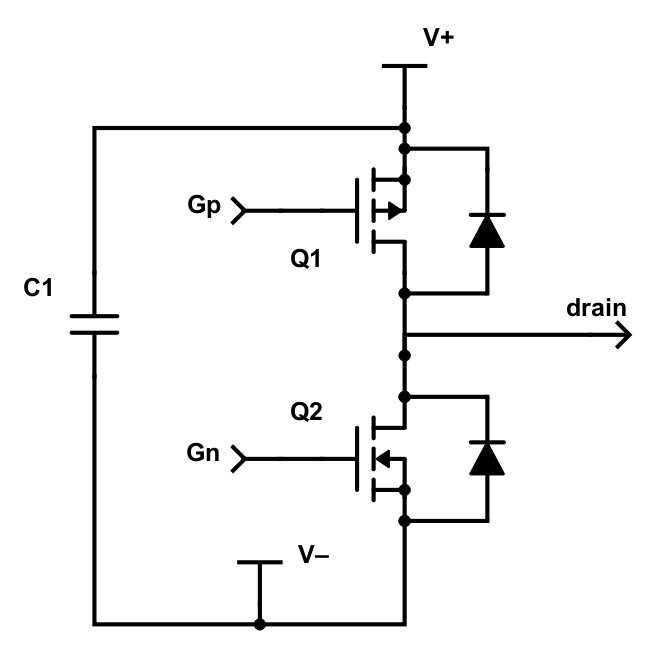 It looks to me like the half-H-bridge will be a perfectly reasonable way for the students to get FETs for the class-D amplifier. 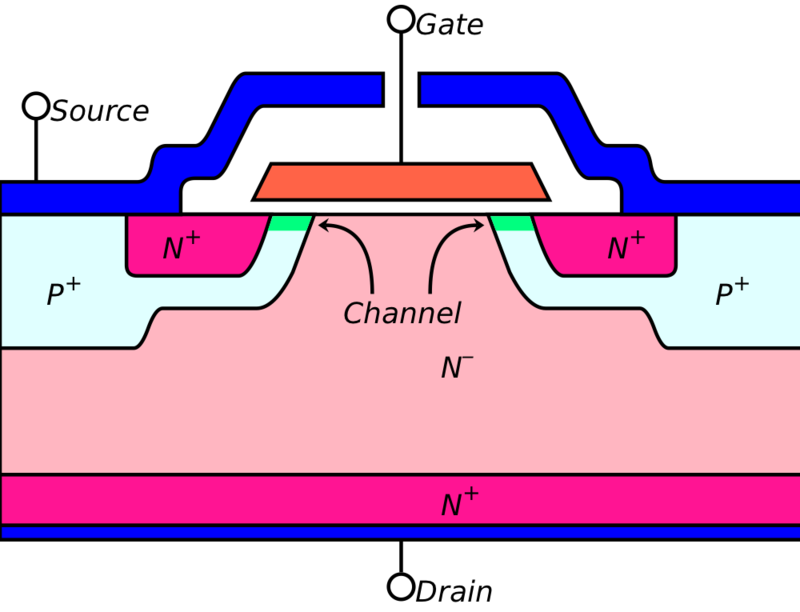 The current will be somewhat limited by the power dissipation of the pFET, but with an 8Ω speaker and 0.1Ω pFET, the power to the loudspeaker should be 80 times the power lost in the pFET, so the 10W limit on the loudspeaker should be reached well before the half H-bridge overheats.